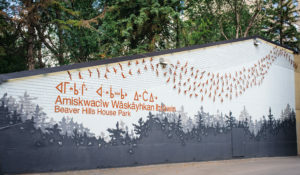 Location: Michael Phair Park * 10124 104 ST.
AmiskwacÎw Wâskâyhkan Ihtâwin (Beaver Hills House Park) invites the public to wander through Michael Phair Park and into Beaver Hills House Park led by a community of Bohemian wax-wing birds. More than 150 bird silhouettes make this artwork a three-dimensional experience as the movement takes people into the park. Flight studies were interpreted as ten different shapes of the wax-wing come to life from takeoff to mid-flight and beyond. This procession is further accentuated by the mural, the edge of the boreal forest – the context of Edmonton and the landscape that is true to this place. Both Cree syllabics and translations are utilized as the main hierarchy to express the Indigenous roots of this special place; a place to gather and share stories about the past, present, and future. Biography: Destiny Swiderski (b. 1981, Winnipeg, Manitoba) is a Métis Canadian artist who currently lives and works in Coombs, British Columbia. She is known for site-specific installation art that utilizes everyday materials that follow a precise algorithm. ​Swiderski grew up north of Winnipeg in Selkirk, Manitoba. Her studies began at the University of Manitoba in Winnipeg in 2002. Swiderski received her Bachelors of Environmental Design in Architecture in 2007. Her studies in Architecture led her to create architectural installations at the Ontario College of Art and Design in Toronto, ON. She has worked for Architecture and Urban Design firms in the west and is currently self-employed as she is embracing her career as a Public Artist. Swiderski’s work uses everyday manufactured materials such as drinking straws, casino dice, and pieces of milled wood to create large scale sculptures that have a three dimensional quality. Her work involves using repetition of one material to explore its new characteristics when applied to an image. Her process is extracted from the landscape to the deep-rooted history that resides in that particular place. Capturing experience is the essence of all of her artworks. Swiderski’s experience working in Architecture has allowed her to be exposed to numerous clients, cultures, and places around Canada. Her extensive knowledge of materials and construction methods allow her to manage, consult, and construct large pieces of art for others to enjoy and interact with. These ideas all stream into how public art can be a vehicle for placemaking.